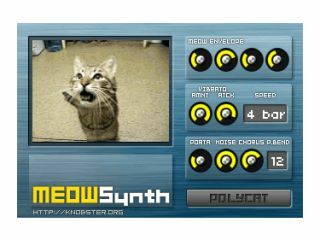 MusicRadar has seen some bizarre plug-ins in its time, but the MeowSynth might just have set a new standard for 'wackiness'. Could this be the start of a new breed of virtual animal emulators? You can find out more about this and four other freeware treats below. Rounding up the latest music-making software that doesn't cost anything is what this page is all about, y'see. Modelled on some unspecified tilt EQs from the 1970s, this simple plug-in promises to enable you to make EQ tweaks to your audio without changing its character (or, to put it another way, you can make it your music sound darker or lighter using just the one knob). You can also give frequencies below 300Hz some special treatment with the Bass Lift knob. Preposterously, this synth really is designed to produce cat-like meow sounds. It's based on a single oscillator with auto-filter and offers mono- and polyphonic modes. Other features include velocity-sensitivity, an internal chorus and tempo-sync'd vibrato with controller attack. We get the 'feline' you'll want to try this (sorry). Said to be suitable for urban sounds, this hybrid bass synth features elements of subtractive, FM and phase distortion synthesis. It's fundamentally monophonic, though there's a pseudo stereo mode, too. Specs include two filters, two ADSRs, a mod envelope and a pair of modulation matrixes. Previously available as donationware, this hybrid VA/AM/FM synth has now been reclassified as a free instrument. 256 presets are included to get you started, and extra polyphony can be added on the fly as you need it (you can use up to 32 voices). Click here for detailed specs. The Pleasurize Music Foundation has been set up in opposition to the so called loudness war - its laudable aim is to improve the sound quality of the music we listen to. The open-source Dynamic Range Meter has been released so that producers can make their music sound altogether more musical - click here to find out more. A Mac version should be available soon.